Denise’s Earth Friendly Da Vinci Watercolor Palette is a carefully curated non-toxic, vegan watercolor palette containing 24 hand-poured half pans. 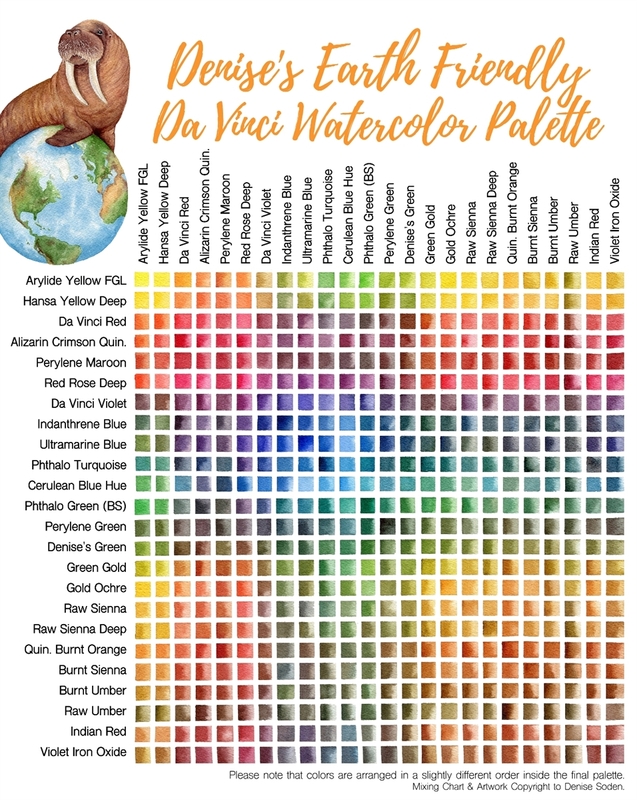 While watercolors tend to produce less waste than other paint mediums in general, this palette allows artists to further reduce their impact on the environment by intentionally avoiding the use of cadmiums, cobalts, manganese, and nickel pigments. Denise has carefully researched each pigment included this set, focusing on their environmental impact while simultaneously striving to create a balanced mixing palette. The set includes some of her favorite primary colors, but is also joined by some eco-friendly alternatives including a cerulean blue hue and a brand new version of sap green (Denise's Green) that she worked together with Da Vinci to create and that maintains a nice glow while avoiding the use of nickel azo yellow. The color selection is rounded off with a wide array of both transparent and opaque earth tones that she is well known for using in her animal portraits. 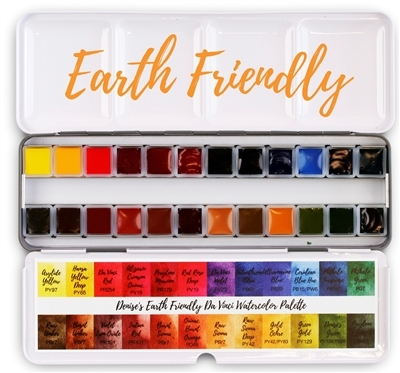 Denise is well-known for her love of sap green, but in curating her new Earth Friendly Da Vinci Watercolor Pan Set, she was striving to create a version that avoided the use of nickel azo yellow while still having a warm, earthy glow. This new blend can be straight from the tube as a convincing natural green, adding indanthrene blue or green gold to deepen or lighten the mixture respectively, but it also cooperates well with other colors. It creates a wide range of rich browns when mixed with reds, moody teals when mixed with deep blues, and even a beautiful turquoise when mixed with cerulean blue hue.